Davit Kajaia (GE-Force, Alfa Romeo Giulietta) and Pepe Oriola (Lukoil Craft-Bamboo, Seat Leon) are the winners of two races at Rustavi International Motorpark in Georgia, in the first round of the 2017 TCR International Series season. 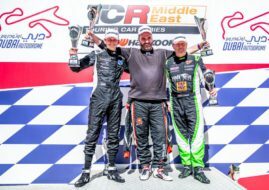 The Georgian driver clinched his maiden TCR victory in front of his home crowd after leading from lights to flag in the 15-lap race at 4,140 meters long circuit, beating Ferencz Ficza (Zele Racing, Seat Leon) and Stefano Comini (Comtoyou Racing, Audi RS3 LMS). The race was marked by controversial clash between Stefano Comini and his former teammate Jean-Karl Vernay in the Leopard Racing’s Volkswagen Golf GTI. They had a contact on the opening lap which damaged Vernay’s car and he managed to finish only sixth, while Comini took podium. After the checkered flag, two cars collided again. That contact damaged a radiator on Comini’s car and his team had to make repairs outside of parc ferme, so he was penalized with a start from the pit lane in the Race 2, insted from the fifth place on the grid. 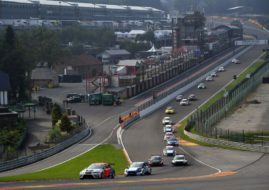 The man on the pole in the second race was 16-year-old Giacomo Altoe (WestCoast Racing, Volkswagen Golf), who was tenth fastest in the qualifying. He defended his lead in the opening lap but after that he lost two places from Lukoil Craft-Bamboo drivers Pepe Oriola and Hugo Valente. The race was shortly interrupted by Safety Car after Mato Homola parked his car in the gravel trap on Turn 1. After a restart, Altoe went off the road and lost his podium position. Attila Tassi (M1RA Racing, Honda Civic Type R) had a fantastic race, progressing from ninth on the grid to the third place, sharing a podium with Oriola and Valente. Vernay finished fourth. Dušan Borković (GE-Force, Alfa Romeo) completed the Top 5 in the second race.